to be reading research material in an area without Internet. The new MegaReader APP offers access to almost two million public domain books, and puts the iPhone4's camera to good use for walkers. 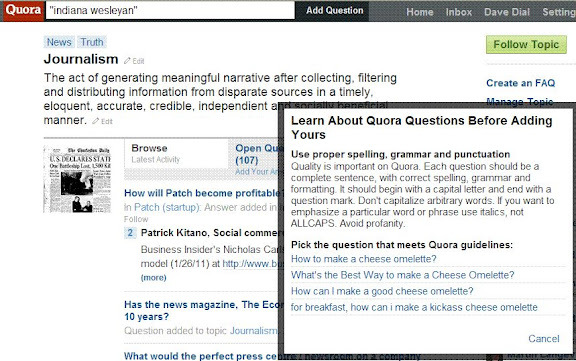 Quora.com is an online community where people discuss various intellectual questions (registration required). One thing I liked about Quora were the interactive helps that guide newcomers in making appropriate posts (see black inset, below). This type of interactive help might be useful in a course management system such as Blackboard. Ellen Ullman at Tech and Learning has offered some predictions for 2011. Most of these predictions sound over-reaching to me.